Car manufacturers design handling characteristics to a certain specification. Usually, they must also do that in the most cost-effective way possible. In other words, some car makers compromise on quality over cost! As a result, some vehicles can end up with a less than desirable handling experience. If you own such a car, you will no doubt be wondering how to improve matters. Sure, you could do the easy thing of just upgrading to a “better” car. But, what if I told you that you could make ANY car handle like a go-kart racer? Imagine being able to drive around sharp corners at speed without facing certain death! You could even go out in rainy conditions and not have to drive at a snail’s pace! Here are some of my top tips to help you transform your mediocre handling into something decent! The first thing to do is remove your stock wheels and replace them with larger wheels and tyres. Aside from looking more visually appealing, there are other benefits to the change. First of all, your car will have more contact with the road as it drives. In simple terms, the more surface area of each tyre contacts the ground, the better the traction. As you know, traction plays a big part in the handling characteristics of a car. Most people tend to buy their new wheels online and use a mobile tyre fitting service for new tyres. That way, there’s less inconvenience and lower costs. When selecting wheels, make sure they come with the right offset and stud pattern for your car. And with tyres, ensure they are appropriate to the most likely driving conditions. For example, tyres with softer rubber compounds offer the best grip for spirited driving! Next, you need to make your car sit lower down to the ground. Your goal is to have a lower centre of gravity. Doing so makes your vehicle handle better. Plus, it also gives your car a meaner stance too! You can buy aftermarket springs from a variety of brands like Koni and H&R. Choosing a set of springs designed for your car is important. Otherwise, you’ll have to get some custom-made. A drop between 35mm and 60mm will suffice. Anything more and your teeth will probably fall out of your mouth due to the harsher ride! Once you get lowering springs, it makes sense to fit uprated shock absorbers at the same time. Some people fit their springs to the standard shocks. But, that’s not an approach I recommend. Why? Because you’re adding undue stress and premature wear to your stock shocks. Aftermarket shock absorbers will also improve the firmness of your ride. The good news is that it’ll do that while avoiding making your ride unbearable. 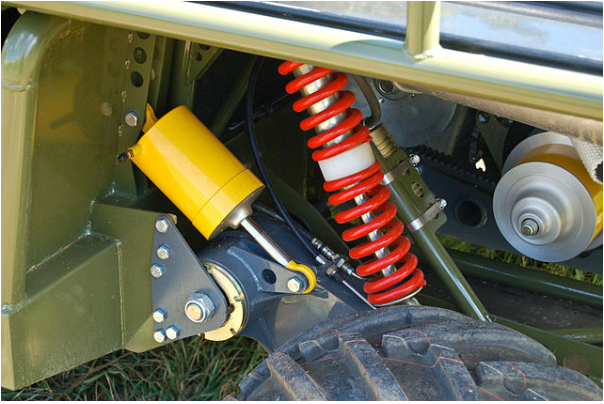 It makes sense to get a matching set of springs and shock absorbers, if possible. Each car will have different types of suspension setups. Many will use wishbone setups that comprise of rubber bushes. The job of those bushes is to ensure there is no “play” in your suspension. The thing about rubber is that it can wear out after a while. A stronger alternative is to fit polyurethane bushes. You might need a press to remove or fit the bushes on your suspension arms. You might not know it, but your car’s chassis flexes whenever you drive it around corners. Many people opt for chassis strengthening through a simple modification: strut braces. In a nutshell, they are metal bars that fit on top of your front and rear suspension turrets. They are bolt-on accessories that strengthen the handling of your car. Plus, they are a complementary add-on for any suspension upgrade. 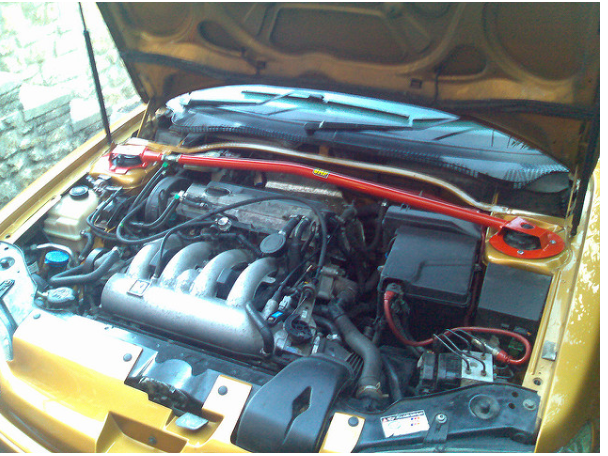 You can get strut braces in a range of different styles and colours to suit your vehicle. Be sure to select ones from trusted brands. The last thing you want is for them to split or get damaged during hard driving! Another way to improve the stiffness of your vehicle on the road is to fit anti-roll bars. To be honest, some cars come with them as standard. But, it’s likely the bushes in them will be worn if they are a few years old. It makes sense to fit adjustable anti-roll bars. That way, you can make the ride quality stiffer or softer, depending on your needs. By adding the above improvements to your car, it will handle like a go-kart racer in no time at all. Good luck and thanks for reading! As a driver it is your duty to take care of your car as best as you can. You’ve got to look out for yourself as well as the other drivers on the road. And the best way of achieving this is to spend time on the upkeep of your car. This will ensure that it lasts longer, and you get the best out of it every time you use it. A lot of drivers decide they’d like to stock up on spare parts for their cars. This is a sensible step to take because it means you can replace anything that stops working. It saves you a trip to the service garage and cuts down on maintenance costs. So, you need to do what you can to try to learn about replacing car parts and then stock up on the parts as soon as you can. The tyres on your car are one of the most important parts. Not only are they paramount for driving itself, but they also receive the most wear and tear of any part of the vehicle. So, you need to make sure you do what you can to check the tyres as often as possible. They need to be in full working order, and you’ll have to change them whenever necessary. It might be an idea to have summer tyres and winter tyres, so you’re changing them every six months. This is crucial for your safety, and for helping to preserve the car as well. Driving carefully is important these days because there are more people on the road. The chances of accidents are much greater, particularly when the weather is bad. You can’t legislate for what other drivers might do. But, you can, and should, make sure you are careful and sensible when driving. This is the best way of staying safe and avoiding any accidents or collisions. You might also want to try to avoid going out on the roads in really extreme weather such as snow. Regular upkeep and checks are the secrets to successfully looking after your car. This is something you need to think about doing as best you can and as often as you can. There are plenty of Ford repair manuals and other guides you can find online. These will help give you an idea of how your vehicle works. You can then use this knowledge to give the car a quick once over each week. Of course, for more in-depth problems you will need to make sure you take the car to specialists. But, the guides should give you a basic idea of what you personally can do to help. Owning a car is a privilege, and one you need to make the most of. It’s not cheap either so you have to be sure you look after your vehicle as much as you can. The idea is to get it to last as long as possible, and to make sure it runs perfectly. The better you take care of your automobile, the fewer problems you will run into at a later date.